This is a newsletter for DuPont employees and was also mailed out to retirees. While it listed the age, it doesn't list the birth or death dates. 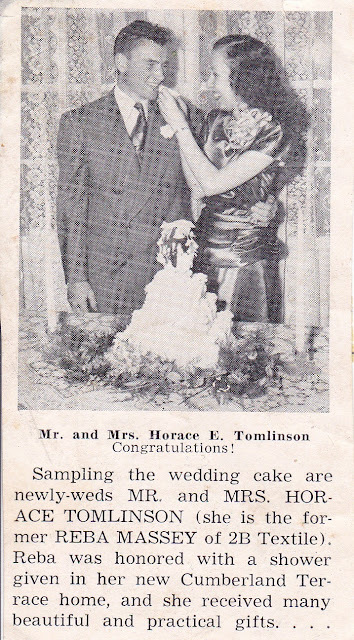 Mr. and Mrs. Horace E. Tomlinson--From The Old Hickory Record. This article was in The Old Hickory Record a company paper distributed by DuPont . Presumably this would have been published in late Sept / early Oct edition as they married September 25, 1948. My Grandmother saved newspaper clippings of people she knew. This was one of them. Reba's parents were Earnest Lillard Massey and Effie Mai Glover Massey who lived on Hadley Avenue in Old Hickory and can be found there in the 1930 & 1940 US Federal Census of Davidson Co TN(Dist 4 Old Hickory). At that time my grandparents, Tom D. & Pearl Jakes Cooke, lived at 911 Dodson Street. That residence no longer exist and has been gone since at least the early 70s as I remember when we would drive down Dodson Street on the way to my paternal Aunt's house(on DeBow St.) Dad would point out that the house they lived in used to be at that corner lot. 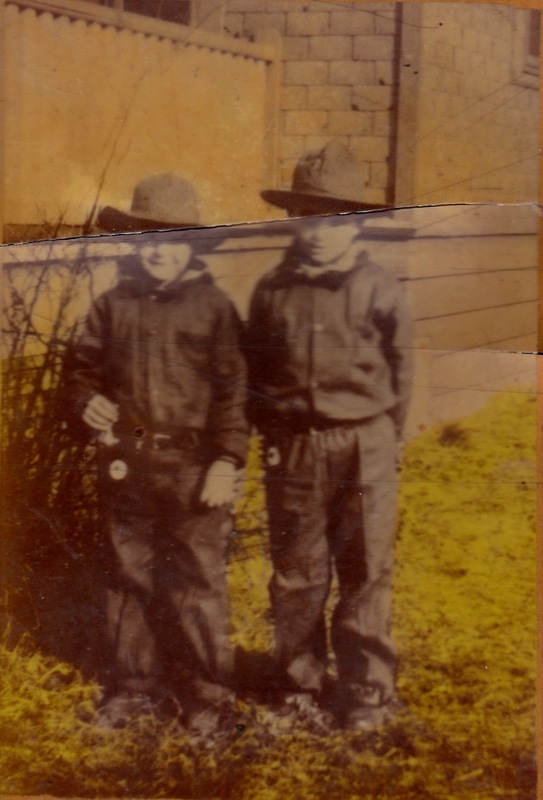 In my earlier post about folks who lived near my grandparents when they lived on Clarke Street in Old Hickory my goal was to identify the persons in the pictures from that time period. Now I've come up with all sort of questions about that time period and place. Do any of these DuPont Company papers still exist? Are they in an Archive? Is there an Old Hickory Directory for the years 1923-1950 or so? I've contacted the Nashville Public Library and the TN State Library & Archives and they have directed me to the Old Hickory Branch of the Nashville Public Library. I'm hoping to contact them and find out if they know the answers to any of those questions. If I do learn more about that I will post here. In the 1990s, I had a boss who was fond of saying, "We don't have problems. We have opportunities." As we approach 2019, I've made a list of opportunities for myself and other areas in my genealogy life where I'd like to see improvements. This is just me "blue-skying"
I'd like to try and improve my focus on my research. Why is it so easy to get sidetracked? Identify the unknowns in my old family pictures. Stay in contact with cousins and share more info about our families. I'd like to make sure that my cousins have copies of the family photos and I hope they will share with me. More researchers blogging about their ancestors. Local Genealogy Societies having ScanFest to preserve local pics. County Genealogy Societies having membership drives & making more of an effort with an online presence which is what it is going to take to interest the younger generation and survive. More Genealogy Webinars from State Societies for both members and nonmembers. An increase in the number of documents available for ordering from State archives via index and online purchases. The above would also be great at the Federal level and a decrease in the price would increase the demand. A new messaging system and username directory at Ancestry that actually works. Better communication for all. Family Stories within our families(so much oral history has been lost), DNA match communication, and communication between fellow surname & locality researchers. May we all have a BLESSED new year full of all the answers we seek. Freddie W. Wauford, Maintenance Locker Room Attendant, retired from the Company under the age requirement on August 1, after more than 24 years' service. Mr. Wauford was born in Alexandria in DeKalb County, Tennessee. He was engaged in farming before joining the Du Pont Company in 1929. He first worked in Plant 1 Textile and was then a Wash and Bleach Operator until that operation was discontinued. 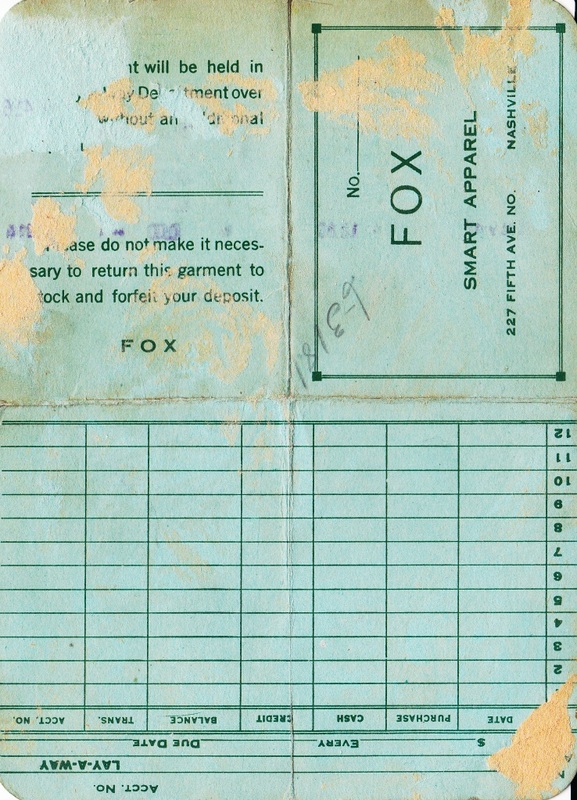 After short periods again in the Textile Areas and Inspections, he was sent to the Maintenance Department in April 1941 as Locker Room Attendant. He remained in this job until his retirement. He was married in 1910 to Miss Ida Washer. They now live at 1302 Jones Street in the Village, where they own their home. The Waufords have three sons and one daughter. Two of the sons are plant employees, Orvestil, who works in Plant 2 Laboratory and William, of Plant 1 Spinning. The other son is a former employee and the daughter is married to Bill Willoughby, who works in Plant 1 Chemical Building. Mr. Wauford says he has no immediate plans following his retirement. Speaking of his career with Du Pont, he said, "It comes from my heart when I say you could travel the world over and not find a better company than Du Pont for which to work. And that group of men in the Maintenance Department is the best bunch of fellows I've ever known. I count every one of them as a friend and want to wish them well." This post continues me gathering more information about the Old Hickory residents who lived near my paternal grandparents. My grandparents lived at 1008 Clarke Street in Old Hickory until some time between the latter part of 1927 and 1930. They moved from Clarke Street to 911 Dodson Street. 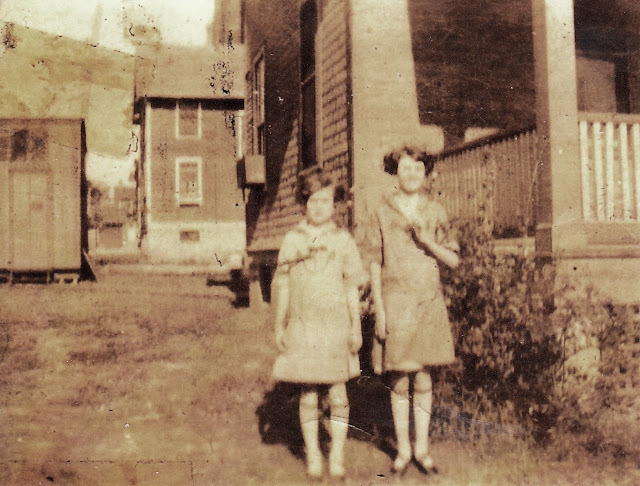 I'm attempting to identify neighbors who might be the "unknowns" in pictures that my grandmother had which are from this time period. As I mentioned in the previous post(see link below), I will be adding these neighbors to the neighborhood tree database at Ancestry. Hopefully, this will help me to find the family of the "not yet identified" persons in these pictures. 1930 US Federal Census Davidson Co. TN; District 4; Enum. Dist. 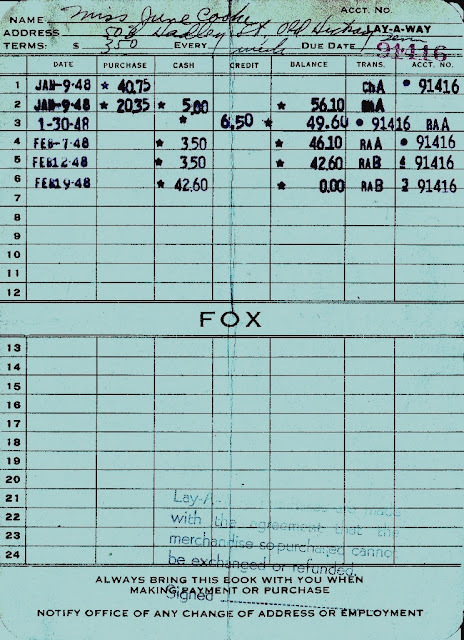 : 0244; Page: 47B; FHL microfilm: 2341977. Ancestry.com images; image 91 & 92 of 105. Rosco Savage-head--24 yrs old--mar at 21 TN TN TN Painter Building Construction Co.
Viola Cooke and the same girl who is the first person on the Left of the Back Row in the above picture. In February of 1927, my grandparents were living at 1009 Clarke Street in Old Hickory, Tennessee when their oldest son died of scarlet fever. His name was Thomas D. Cooke Jr and his parents and siblings always called him Tomie D. I have several pictures of him with friends and family that I have published on my webpage, in my tree at Ancestry, and here on my blog. 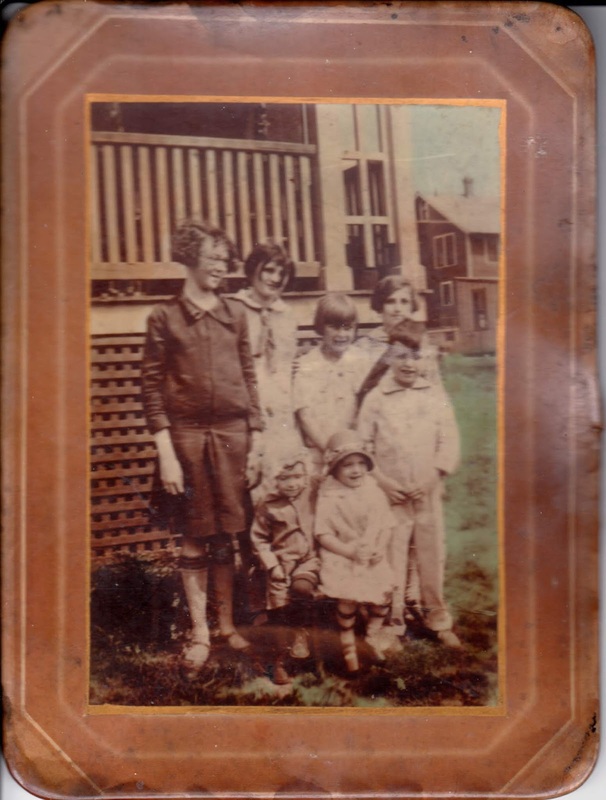 My grandmother had pictures of him and his sisters with children from the neighborhood where they lived which came into my possession as the family historian. I can identify my aunts, and Tomie D. in the pictures but do not know who the other children are. Presumably, they would be children who lived near them on Clarke Street or the surrounding streets. I thought it might be good to review the area and look at the folks who were living there during 1927 but so far I have been unable to find a city directory for that area. 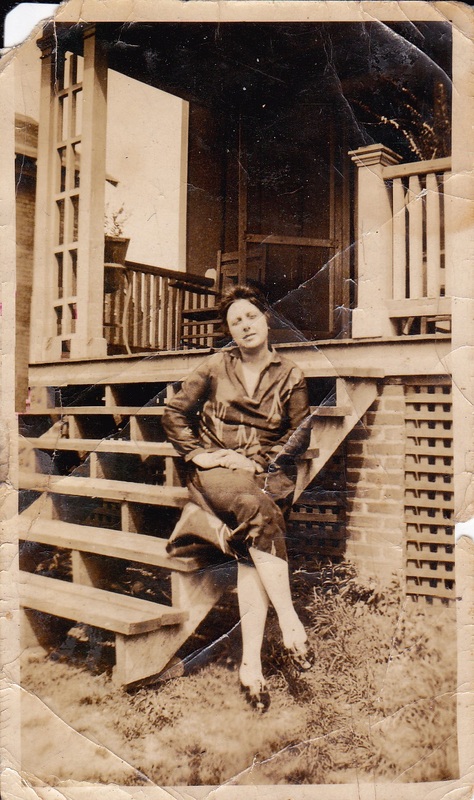 My grandparents moved to 911 Dodson Street(Old Hickory) shortly after Tomie D.'s passing but I wanted to see who all was living in that area of Clarke Street in 1930. Maybe eventually I'll be able to find some sort of listing. Old Hickory was a company town at least prior to 1945/46 so all residents on that street were renters. I've contacted TN State Archives and the Nashville Library and neither know of a directory for that area covering the time period. For the time being, I'm studying the 1930 census and hoping to learn more. I"ve started a research tree on Ancestry for those who lived in that area and have begun researching the families and the houses. The houses, which were Sears Modern Homes, are just as interesting as the people. Looking at Google's street view I was able to see how they look present day. As you might imagine, some have been modified, but they still retain enough of the features to allow for identification. The styles on Clarke Street both on the north side(odd house numbers) and the south side(even house numbers) seem to be either a Georgia model or a Haskell model home. I'd love to know the identity of the other boy in the picture. I would guess they are about the same age. Also, I'd love to hear from other descendants of people who lived on Clarke Street or Dodson St in Old Hickory Tennessee between 1923-1946. Below is a little bit of the household information I was able to gather from the 1930 census as well as my additional comments on the house style from viewing them on Google Maps. I'll post some more pictures and additional households for the south portion of Clarke Street in a future blog post. 1930 US Federal Census Davidson Co. TN; District 4; Enum. Dist. : 0244; Page: 47B; FHL microfilm: 2341977. Ancestry.com images; image 94 of 105. 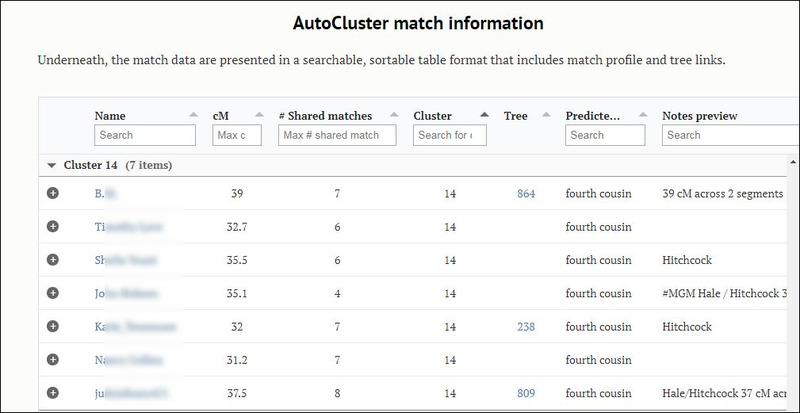 An amazing new Auto-Clustering tool from Genetic Affairs is the latest tool available to aid genetic genealogist in building genetic networks. The leaders in Genetic Genealogy have all been blogging about it. If you're interested in learning more about it, check out the links included at the end of this post. This tool allows me to "drill down" in my matches at Ancestry where I have over 2500 4th cousins or closer. I've run several reports using varied settings. The example shown below was done with the settings at option A and amounts 40cM-15cM. It's having timing out issues right now due to size and my double colonial ancestry but this is really great output despite that. Below is an annotated screenshot of the output. I've not included the DNA Matches names which run across the top and down the left margin of the report. This is just the top portion of this particular report. 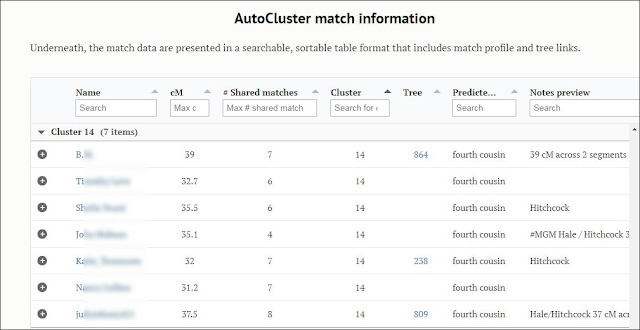 There are a total of 68 clusters in this report. I believe that each person's results will vary depending not only on their settings but also on their family dynamics and the number of family members(both close & distant) who have tested. Another Christmas Card from my Paternal Grandmother's collection. 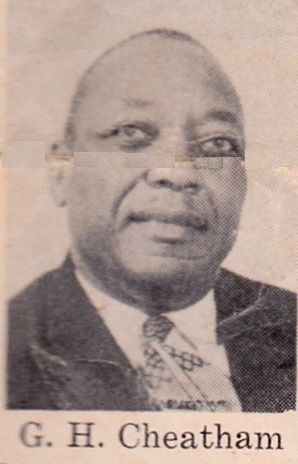 This one is also from Granny Pearl Jakes Cooke's brother, Will B Jakes and his wife Georgia. Do you mail out cards during the holidays? Did your family mail out cards? Did any family members save cards they have received? I've spent the last week getting my Christmas cards ready to mail. Not an easy task with my reduced visual field but it's one of the traditions I'll continue as long as my eyes let me. Blogger Chris Otto posted on his Papergreat blog, about a vintage Christmas card by Hawthorne-Sommerfield that he has. 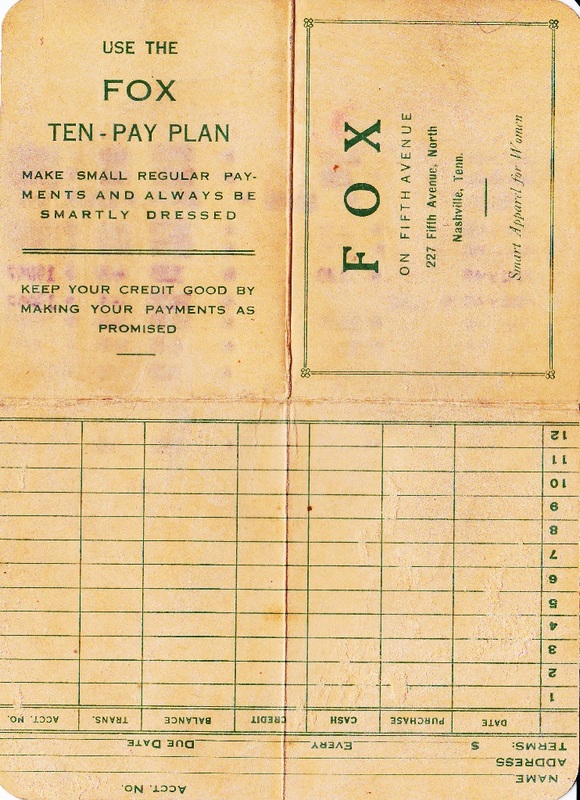 I found one of their cards among my grandmother's papers. It was a Christmas card she received from her brother, Will B. Jakes and his wife Georgia. There wasn't an envelope with it so I have no idea what year it was made or received. 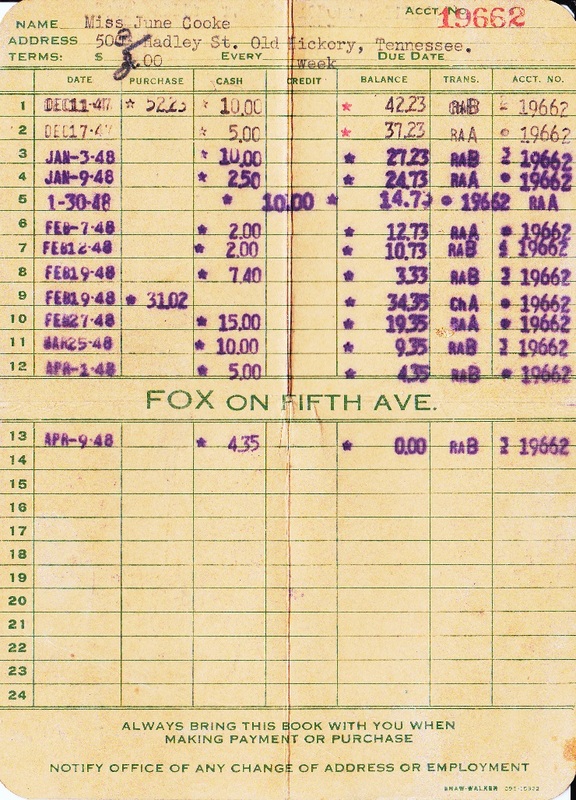 The bottom portion of the back of the card and the only info on the card. Today's blog post focuses on the Ralston Project at FamilyTreeDNA. While I have no direct Ralston connection, I do have Ralston cousin connections thru my King and Manire lines. One of those cousins happens to be one of the administrators of the Ralston Project. As a Ralston, I cannot tell you how many times in my life I have been asked, “Are you kin to the Ralston in Ralston-Purina?” We’ve all heard of it: Checkerboard logo, Rice Chex cereal, Chex mix for parties, Purina Dog Chow, Animal chow for just about any animal you can name. The fact is, there never was a person named "Ralston" associated with the Purina Feed company. It was a marketing ploy, to piggyback on the Ralstonism movement that was popular near the beginning of the twentieth century. But the net effect has been that everyone in America knows how to spell and pronounce the surname “Ralston". Or to put it better, we North Americans have all been brainwashed to this mindset. There are over a dozen legitimate ways to spell the surname. There are probably at least 6 distinct ways to pronounce the variations in spelling. But the marketing efforts of the Ralston-Purina Company, TV ads, and the rest, have homogenized the spelling and pronunciation of the Surname Ralston, in North America. That is not necessarily a bad thing. It makes it easier for strangers to understand how to spell and pronounce the name. But other spellings and pronunciations are accepted elsewhere in the English-speaking world. So, Americans and Canadians should be aware that "RAWL-ston" is not the only way to pronounce it. That is just the way it has been pronounced in advertising for the last century. So, in this limited context, the word R-A-L-S-T-O-N is an acronym for the following: Regime, Activity, Light, Strength, Temperation, Oxygen, and Nature. For more information visit Ralston Project at FamilyTreeDNA.com or The Ralston Project. If you are actively working to identify what relationship you share with your DNA matches, you have likely heard of the What Are The Odds tool, commonly referred to as WATO. It is part of DNAPainter.com and you can learn more about all of the tools by visiting the website. While I use the tool mainly when I'm helping adoptees, lately I've been using it to get a visual of the assessment of people who have tested from specific ancestor couples. One of my larger AncestryDNA Circles is that of Jabel Putman my 3rd Great Grandfather. There are 106 members but I want to know if these testers represent someone from all of his children or just ones thru several branches. He is believed to have had 12 children. Using the WATO tool I chart each line from Jabel to the tester. I also look at the shared matches within the circle members to see if I can identify others who are descendants of Jabel who weren't included due to not having him in their tree. I have added some that I've found at other sites as well. Below is a closer look at two of the children of Jabel. I didn't show the right side of the chart as it contains the names of living and testers but it gives you some idea of how it looks. The chart is a work in progress. I will be adding more testers as I identify them. Please note that there are varying amounts of testers from each of those children's children who have tested. Below is a zoomed out shot of the chart(just a small portion of it) which continues out to the testers on the right for each line. This can be used to see the coverage or to identify testing opportunities. 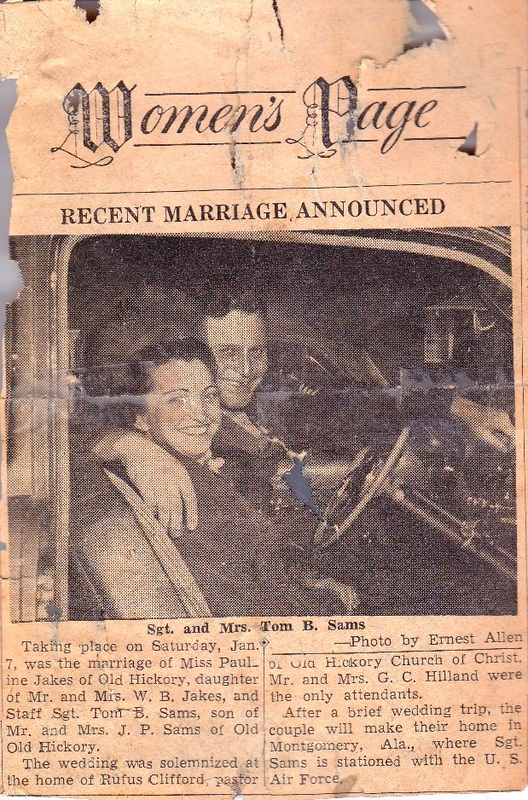 I have been planning for what seems like forever to go thru papers that were salvaged from Granny Cooke's Scrapbooks. To tell you what all the scrapbooks have been thru would take up more time than I wish to spend on this post. Let's just say it's a miracle any of the contents survived. I've had manila folders full of the contents in a file box for a number of years. This weekend I processed a good bit of them. I took each of the papers and put them in sheet protectors. After arranging the pages in chronological order in a 3 ring binder, I began the process of cataloging each page. I've finished with this notebook for now but I think it's safe to say there will be more added once I am able to get to some of the other files. The papers cover the time period from 1943 to 1976. The following is a list of some of the types of papers that were included. 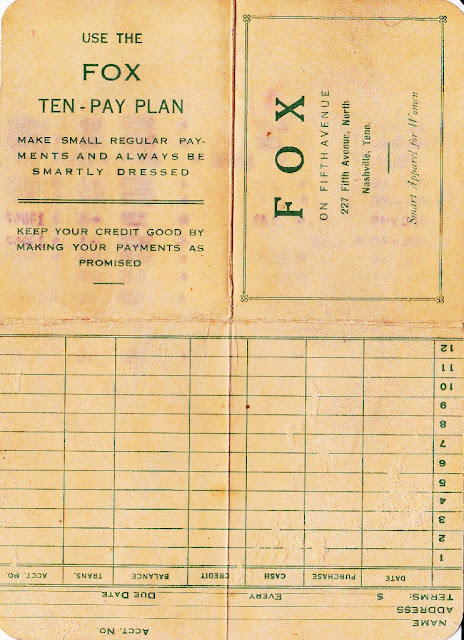 These papers all had dates on them and most even had addresses. This captures what was going on with the family at that given point in time. Among the things that my paternal Grandmother had in her Scrapbooking box were two store credit/layaway payment cards. The cardholder is her daughter--my Aunt June. The store sold women's apparel and was located in Nashville. 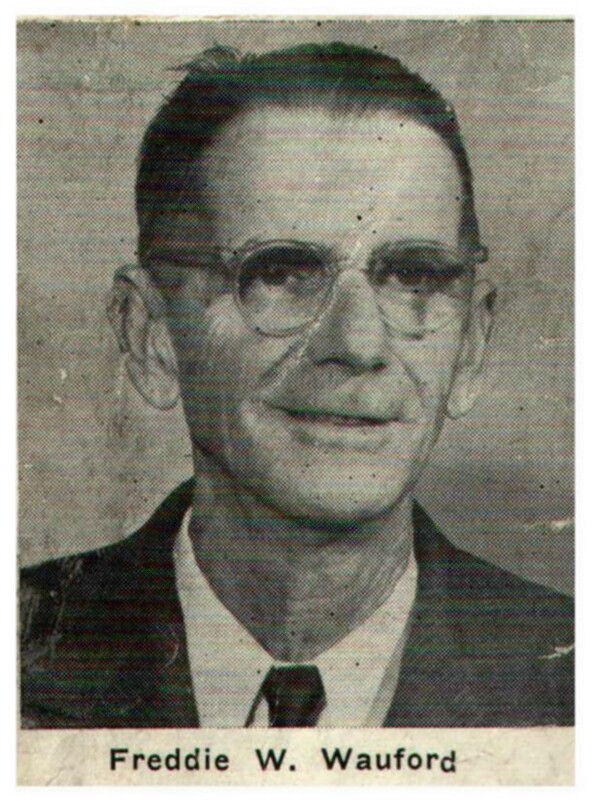 The time of the purchases and layaway(early 1948) coincides with Aunt June's wedding to John Arnette Brannon. Their wedding announcement describes the outfit she wore as a navy blue suit with matching accessories and also mentions that she wore red roses on her jacket lapel. June was working for Southern Telephone Company during this time. What was the most recent Federal Census available to the public when you began researching? For me, it was the 1910 census. A few months after the 1920 Federal Census was released I spent a great deal of time on the 5th floor of the Wallace State Community College Library(Hanceville, AL) in their Family History Collection viewing my ancestors on microfilm and giving my arm a workout advancing and rewinding the film. It won't be too long until we will be able to access the 1950 Federal Census from home. It will be released to the public on April 1, 2022. I feel old...and grateful. In what area will you be looking for your ancestors(or yourself if you were alive)? If you don't know, you need to ask someone who does know. You might try consulting a City Directory. That's what I did. I thought I knew where my Dad and his parents would be but upon consulting the directory, I found out that I did not. Dad passed on 7 years ago so I'm not able to ask him where he was living. Consulting a Nashville Directory I found a 1950 entry of Thos E Cook(Pearl) which I believe is my Grandparents(Mr. & Mrs Thomas D Cooke). My Uncle Morris is also listed at the same address and my grandfather's place of employment and job title are what they should be which reinforces that I have the correct entry. The 1950 directory gives 1301 Gallatin Road as the address where my Grandparents lived however the address listed in the 1951 Directory is 1311 East Greenwood Ave. Between about 1954 and mid-1960s, my grandparents rented homes and moved frequently. Sometimes Tom and Pearl had separate households. I do have listings of the addresses I obtained from my grandmother's correspondence as well as a wide variety of receipts and other papers which she and Tom saved. I would have expected them to still be living at 911 Dodson Ave in Old Hickory because I had been told that my Grandmother insisted that they stay there until my Dad returned from the service. He didn't enlist until 1952 and had been working at Dupont prior to his enlistment. He returned to work there when he came back home from Korea. Apparently, my Grandparents begin moving around abt 6 years prior to what I'd always been told. Mom is still living so I asked her if she remembered where her family was in 1950. She is "pretty sure" she and her family were living at C.P. Moore's place in Bone Cave in 1950. She was 10 at the time so this may or may not be where they were. Bone Cave is in Van Buren Co TN and even if I have to read the entire county it won't take near as much time to find her as it would if I had to do the same for Davidson Co TN for Dad. There is also a slight possibility that they were in Lincoln Co TN as her family was sharecroppers and frequent movers. This should be fun. We've got a little under 4 years to figure it out. Here's hoping that indexing for it will happen as soon as possible once it is released. Allowing people to view your Ancestry tree is now easier than ever. This will be a huge help not only for DNA testers but for sharing in general. I will be using this for most of my tree shares. It is almost impossible to send a tree share invite to those who use their name instead of a username and who aren't able to see the tree because of a lack of a subscription. This will take care of that. 1. While viewing the tree you wish to share, select Tree Settings. Under Tree Settings select Sharing. Under the Sharing section, Select Invite People. 2. Notice there are now 3 ways to share the tree. Select Shareable Link. 3. You can choose the roles: Guest, Contributor or Editor. Also, the option to allow them to see living persons is available by share link. 4. Once you have selected the Create Link a unique URL will appear which you can share. Please note the blurb above the URL for more info on how the link will work. 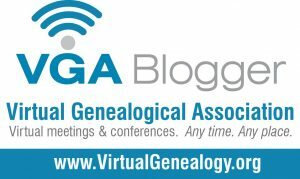 Earlier this month, I attended Gena Philibert-Ortega's webinar--“Researching Your Female Ancestor by the Company She Kept.” The webinars are one of the perks of being a member of the Virtual Genealogical Association(VGA). So today I'm making a list of "communities" to research for my not just my female ancestors but my male ancestors as well. I hope to be adding to this list so this blog post will(I hope) have many updates. Looking for Locations? Check Pension files. I really enjoy pension research. It's great for finding out where our ancestors and their families were living. Knowing that information can help us find even more documents and clues in areas in which we might not otherwise have known to look. One of my autosomal DNA matches has a William Eakin who is living in the same county where my paternal lines lived. This may or may not be the connection to my own family. I read thru the application (and later the transcription which I found within a Family Tree file at Ancestry) because I wanted to know where this family had been before coming to Tennessee. "United States Revolutionary War Pension and Bounty Land Warrant Applications, 1800-1900," database, FamilySearch (https://familysearch.org/ark:/61903/1:1:N9N5-857 : 9 March 2018), William Eakin, pension number W. 3530, service S.C.; from "Revolutionary War Pension and Bounty-Land Warrant Application Files," database and images, Fold3.com (http://www.fold3.com : n.d); citing NARA microfilm publication M804 (Washington, D.C.: National Archives and Records Administration, 1974); FHL microfilm 970,883. This is just a small portion of the information included in this pension file. Who knows what is waiting to be found for your families. Sometimes, we tend to think that just because our ancestors didn't have the transportation modes we have today, they just didn't travel that much. Read through a few Pension application files. I assure you, that is NOT the case. Many of my Tennessee lines(some direct and others cousin lines) went to Texas from Tennessee. Some returned to Tennessee while others stayed in Texas or moved on to California. This was all before the automobile was on the scene. Check the FamilySearch's Wiki page for more information about Pensions. Results posted for my family's Y-111 marker DNA test several weeks back and I'm just now getting around to blogging about it. When we tested at 37 markers we were close to descendants of Shem Cooke(1722-1796 Amelia Co VA) but our Y results were also close to a group of Patterson men. By "close", I mean ranging from a genetic distance of 0 to 2. So I upgraded to a 67 marker test and began studying all of the matches and where they had settled. Just out of curiosity I also looked at the matches at 25 markers and could see that it had even more who were from the line of Shem Cooke. At 67 markers we were still a genetic distance of 0 with one of the men from the Patterson group and were at a genetic distance of 1 -3 with the Shem Cooke descendants. With the upgrade to 111 markers, we are now at a genetic distance of 2 with the Patterson tester we matched at GD=0 in the 67 marker level. Also at GD=2 is the Shem Cooke descendant who also has a small match with my brother's autosomal test. This descendant of Shem is from a line that moved to Carroll Co GA during the early 1800s. So, for now, I'm still studying records in the earliest place our Cook line is known to have been as well as studying the lines that came out of Lunenburg Virginia on to Granville Co North Carolina and later to parts of Arkansas, Georgia, Mississippi, Missouri, and Tennessee. I've put all of the close matches from each level who are from the Patterson or Cook(e) lines into a spreadsheet. Even though I don't have all the answers yet that will make the direct connection between my 2nd Great Grandfather and his Cook linage I do have way more information on the lines and a better idea of where to look. Also if you descend from any of the Cook(e)s who were in Bedford, Rutherford or Williamson Co TN thru the direct male line consider doing YDNA at the 37 marker level AND an autosomal DNA test. If your Cook lines were from that area and you aren't thru a direct male line you can still take an autosomal test which might find a connection for you thru this or other lines. I'd love to hear more discussion about what others are doing with their YDNA test results as far as analysis and findings. I need to brainstorm/blog what to do next. I've been using DNApainter(a WONDERFUL DNA analysis tool by Jonny Perl) for a while now. I'm not sure the exact date, but it couldn't have been more than a few minutes after I read about it in the Genetic Genealogy Tips & Techniques Facebook Group. You can learn more about both of those by clicking on the linked text. DNApainter is free but has additional tools available for subscribers. Today I subscribed and I've been playing around with it. I wanted to see what kind of coverage I had from my matches at GEDmatch. I had used my kit and my Mom's kit to phase my DNA matches. My Dad passed before we began DNA testing. While the Paternal Phased kit is not a true comparison against his it will show all the matches I have which aren't Mom's which are presumably paternal. At GEDmatch, I ran Tier 1 Matching Segment reports for each phased kit and saved each as csv files. You should set the minimum cMs high enough to reduce by chance matches. I set mine at 12 cM for this. I can delete matches if necessary later. At DNApainter, I opened the New / Blank Profile and used DNApainter's premium feature to Import Paternal phased (P1) & Maternal Phased(M1) match list. As I imported each phased group, I chose a color, name, and identified it as paternal or maternal matches. It was abt at 74% coverage(I wish I had taken a screenshot then but I didn't) and I wanted to import the data from the painting I had done on my main profile. I exported the segment information from that main profile and imported it into the Marie GEDmatch profile.so that I could identify more matching segments. Once the main profile is imported here is how mine looked. Now to look at each chromosome and collect the clues. For those that haven't been following my search to find the identity of Joseph S. Cook who died in Williamson Co TN here is the short version of that. I've located two Joseph Cooks in the 1820 census in areas where my families were and I want to know if either of these is the Joseph Cook who married Tamar Northern in 1803 Granville Co NC. I believe he is the one who is in Simpson Co KY and is listed with Northern families near. The other Joseph Cook is enumerated in Wilson Co TN near others who have Granville Co NC ties and who will in a few years end up in Williamson & Bedford County Tennessee area. Our Cook Y DNA points to descendants of Shem Cooke(he died in 1796 in Granville Co NC and was from Amelia Co VA). I also want to determine if either one of them is the Joseph S. Cook from Williamson Co TN. 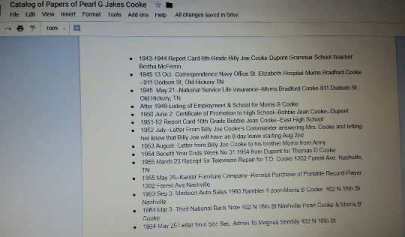 To add to the confusion, the probate papers of 2 other Joseph Cooks(one of which IS Joseph S Cook) have been combined and labeled as the Joseph S. Cook in Williamson County TN records and as such, that is how it appears within the Ancestry database. Joseph S. Cook died without a will and Wm C Cook(my 2nd Great Grandfather) was appointed admin of Joseph S. Cook's estate and reported an inventory and sale of the estate. The other Joseph Cook in that file folder left a will and the majority of the papers in that folder are for his estate detailing the division of his property among his children. He died a few years after Joseph S. Cook and lived in Davidson Co and I believe he was a resident of Dist 2 Williamson Co TN. So I had looked at the entry for the marriage of Joseph Cooke & Tamar Northern in Granville Co NC but never really looked at the marriage bond. It was hard to find as it is incorrectly indexed as James Nothern instead of Tamar Northern. I think part of that comes from an indexer who isn't familiar with the document that is being indexed and what to expect on it. The first name on the bond is that of James Turner who was Governor of North Carolina at that time. The bondsman who signs with Joseph Cook is David T W Cook. 4500 acres in West TN on Duck, Big Harper, and Elk Rivers. A petition for divorce filed by Lydia Cook in Currituck Co. NC against David T W Cook. U.S. Army, Register of Enlistments, 1798-1914 1798 May 17-1815 ----- "C"
This was a wonderful find as there are biographies for her, her siblings, and her father, John Nelson. The bio entry has sources and while focusing on the Nelsons and their lives, has a bit about David Taylor Woodward Cook. The story of where the Nelsons were from, why they came to Louisiana, Mississippi and for a time parts of Tennessee including, Williamson County, Tennessee is in the bios on the Nelsons memorial pages. They are a great read separate and apart from this mystery. Do yourself a favor and read them. David T. W. Cook to Austin, July __, 1822. Came to Texas to see you "in behalf of myself and many others." Wants land. The above-mentioned letter dated July 1822 is as noted asking for land and was delivered by Austin's brother. David T W Cook says he will be "on the River Brassos 3 weeks" and asks him to direct any communication to Mr. Andrew Robertson. American State Papers: Documents, legislative and executive, of the Congress of the United States ... / selected and edited under the authority of Congress. pg 63 and pg. 774 Listed among the settlers with claims west of the Pearl River. I found David T W Cook among a long list of names for Land Holders in Louisiana. Louisiana Meridian 020N - 002E Lot/Tract 1 Section 20 Union Co.
Do I have the answers or the connection? Not yet. I have a lot more questions and a great number of resources to check. Would I love to find one of his direct male descendants? You bet. My brother has taken the YDNA test and I'd love to compare. We are currently waiting on our upgrade from Y-67 to Y-111. I found a book available at HathiTrust Digital Library It's written by Thomas L. Wilson and titled Sufferings endured for a free government; or, A history of the cruelties and atrocities of the rebellion. Complete with a table of contents, it tells the stories of many folks who lost their lives during the time period of the Civil War. Since the text is fully searchable I was able to find an incident from a county in which many of my maternal ancestors lived. Though there is a difference in the spelling of his name, I believe that the story "Murder of Phileneas Plumley" is detailing the events of the death of Finis E Plumlee of Van Buren Co TN. 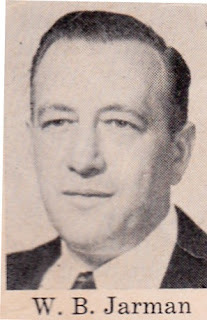 Finis was married to Lucinda Sparkman. I have numerous connections to the Sparkman family thru marriages of my cousins. "He left a wife and seven little children(who all witnessed his murder) to mourn the loss of a good husband and father." I did find another incident which was claimed to have taken place in Clinton County Tennessee. While there is a Clinton, TN, there is no Clinton County TN. I believe the author meant Kentucky instead of Tennessee as I was able to find a record of the person he mentioned living in that county in Kentucky. Wilson, Thomas L.(of Tennessee), Sufferings Endured for a Free Government; Or, A History of the Cruelties And Atrocities of the Rebellion ... Philadelphia: King & Baird, 1865. (Online at https://catalog.hathitrust.org/Record/008653811). Tennessee, Van Buren County. 1850 U.S.Federal census, population schedule. Database with Images. Ancestry http://ancestry.com Tennessee .> Van Buren > Dist 3 > Pg 374, line 18( image 4 of 8). Tennessee, Van Buren County. 1860 U.S.Federal census, population schedule. Database with Images. Ancestry http://ancestry.com Tennessee .> Van Buren > Not Stated > Pg 3, Line 1(image 6 of 60). Tennessee, Van Buren County. 1870 U.S.Federal census, population schedule. Database with Images. Ancestry http://ancestry.com Tennessee .> Van Buren > Not Stated > Pg 2, Line 15(image 2 of 7). Find A Grave, database, and images (https://www.findagrave.com: accessed 04 September 2018), memorial page for Finis Ewing Plumlee (5 Jun 1820–5 Feb 1864), Find A Grave Memorial no. 19885633, citing Sparkman Cemetery, Van Buren County, Tennessee, USA; Maintained by Ash Far (contributor 46913275).